France is paradise for the cycletourist. I lived outside of Paris with my family for a year (1988-89), and miss the place and all the friends we made there sorely. French cyclists are poorer and richer than American ones. They are, by-and-large, poorer in hardware. They are much richer in cycling skill. 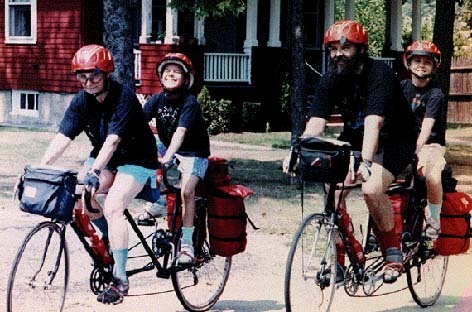 It is enlightening to see a couple of 50-something guys riding on old bikes with cottered cranks, Mafac centerpulls and tubular tires cruising along at 20-25 klicks side by side, with their handlebars maintaining a constant gap of 3 or 4 inches between them. When little old ladies ride to the boulangerie for their daily bread, they know how to park their bike with one of the pedals braced against the curbstone--nobody in France uses kickstands, except for mail delivery bikes. You will never see a wrong-way rider, people don't weave about, they ride in a straight line. This is both good and bad for the visiting American. You can learn a lot by riding with and watching these people. Motorists have different attitudes and expectations than they do here. As you ride along a main road, you can rely on it that the car waiting at the stop sign at the cross street will yield to you. On the other hand, passing motor vehicles expect you to keep control of your bike and ride in a straight line, so they will pass much closer to you than American drivers would do. When I was living in France I was visited by a good friend who is a noted authority on cycling in traffic and an Effective Cycling instructor. As we rode along a beautiful winding two-lane country road, he allowed his attention to wander a bit, and swung out to the middle of the lane, where he was very nearly squished by a bus that came around the bend at a good clip, not expecting a slow-moving vehicle to be so far from the edge of the road. The slight deviaition from line my friend made would have been perfectly safe in the U.S., because cars here assume a bicycle may be ridden by a child or an imbecile, and give a wide berth as they pass. When I was there, helmets were almost unknown. Maybe 5 percent of road cyclists wore helmets, and these were of the "leather hairnet" or "sausage" type. Modern helmets were worn only by mountain bikers, and were in fact refered to as "casques VTT" (ATB helmets). Several times I was greeted by French cyclists with a cheery "goud morrneeng", usually the extent of their english. They could tell I was an American by my Bell. You will hear stories about how rude the French are, often with the explanation that it is because they have no use for people who don't speak French with a perfect accent. I believe that the origin of these stories is cultural misunderstanding. The French are a very courtly, polite people, and don't feel the need to conserve syllables in their interactions. For example, if you knew a bit of French, you could go into a bakery and ask for a loaf of bread, pay for it and leave. You would be wrong. When you enter the bakery, you say "Good morning, ma'am" first, ("Bonjour, madame"). The baker says something similar to you, then you may talk about bread. When you leave, you say "Goodby, ma'am" ("Au revoir, madame"). If there are other customers present, you include them in your greetings, usually by using the contraction "'sieu-'dame". These locutions seem a bit weird and stilted to an American, but they are considered common politeness in France. If you omit these niceties, you will be perceived as arrogant and brusque, and will be treated accordingly. If you take the time to observe these cultural practices, the French people you meet will be amazed and delighted, being used to Americans who don't know any better. You will find them truly friendly, even if your accent is less than perfect. They also love tandems as much as anybody, although they are less rare there than here. We all know what a great "ice-breaker" a tandem can be. The following is from a thread on the [email protected] mailing list. When we rode Paris-Brest-Paris in '87 and saw bikes/riders like this on the ride, we knew "There will always be a France" - these guys are tough! > Motorists have different attitudes and expectations than they do here. > closer to you than American drivers would do. I didn't sense that they passed close, but rather that the motorists seemed extremely competent at coping with cyclists in the road, unlike in the US. In France (this was not during PBP, BTW) the cars would switch lanes, pass, and return to the right lane promptly. In the US, cars pass and manage to get back in the right lane somewhere in the next mile or so - that's how we get all those passing-car-nearly-hits-oncoming-traffic events. I felt that the French motorists gave us a reasonable amount of room and yet were across the middle line for a minimal amount of time. At any event, I enjoyed being passed by cars in France. They made me think they knew what they were doing. You could say that they "know where their bumpers are". This is _excellent_ advice; we got the same from our French teacher, and it served us well. In spite of this, though, I still think the front-line commercial/retail people in Paris were often rude In the countryside, and in better-mannered parts/establishments of Paris, Sheldon's advice is critical to your vacationing happiness. Willamette University  "Speaking for myself, not the university"
We did a month in France last year. The French are wonderful hosts. After a month riding in the countryside, we were confident enough to ride through the center of Paris during rush hour. They must like old people on tandems. To me, France is pretty close to cycling heaven. A few points to remember: When speaking to anyone start in french no matter how bad your french is. (imagine someone asking you a question in french on your streetcorner) My french is pretty dismal, but I can usually tell someone that I'm not comprehending and wait for my wife to bail me out. Often the person I'm talking to will figure out that their english is better than my french. When you can find a bike path it's great. They're usually on one way alleys and adjacent to pedestrian walkways and are hard to find. I was in front of a train station plotting a path via main roads across the city when an elderly man gave me the most bizaare set of instructions. He penciled in several alleys that led to a bike path. The path wasn`t a mile long but a small detour on sidestreets. I had a friend who was born/raised in Brittany say that Parisians are rude to anyone without a Parisian accent. I guess it's like a New Yorker waiting for a southerner to get the sentence out. My wife seems to get good service in france even from people that are initally rude. Department store clerks seem to want to pass you from one to the other. My wife usually gets sent to another person who tries to pass her off to another. She usually goes back to the first person she asked and tells that clerk their word was wrong and it's their job to get it right.... (It sounds like she's ready to start an argument) and they suddenly become REAL helpful. I think if they feel that they can brush you off, they will. A bit of persistence goes a long way here. We found the canals in Brittany (sp) We rode north from Rennes toward St. Malo. The ride was beautiful. Through the countryside. We followed a couple in their sail boat for a while and watched the locks work. We then left the canal to go the Ponterson to see the Tour de France. The tow path is a good bike path but it can get a little bumpy in places. The next time we go we will take our new fully suspended tandem. It will be more comfortable for both of us, certainly much more comfortable for Dian. 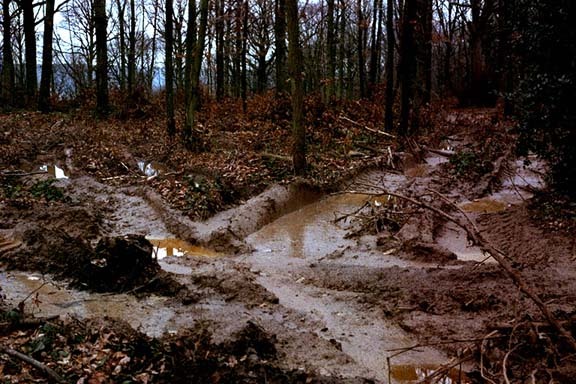 Where I lived, the mud made off-road cycling impracticable in the winter. Hundreds of years of horse droppings mixed with clayey soil creates a mud of unusual adhesive properties!